Some airlines are better than others when it comes to peanut and nut allergies. 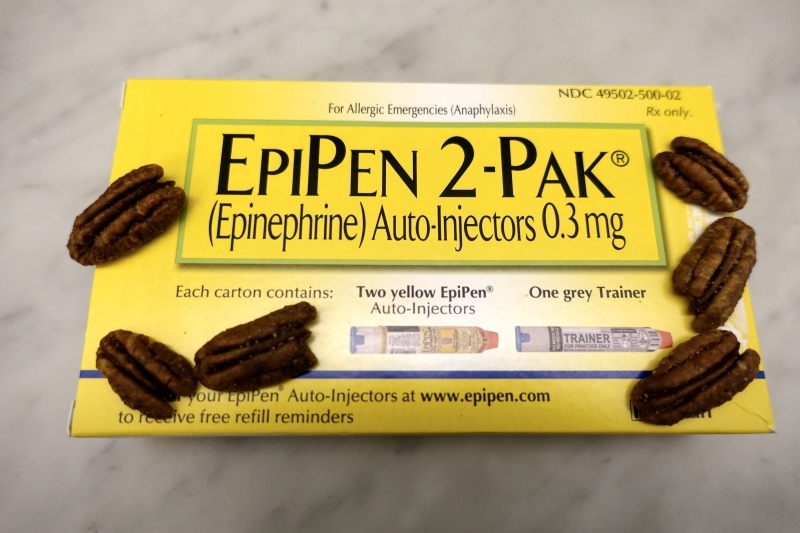 These allergies are some of the most prevalent of all allergies, and in general I'm very sympathetic to allergy sufferers, given that in my family there's a life threatening bee sting allergy that we carry an Epi-pen for, plus severe dog and cat allergies that mean we always stay at a hotel when visiting family or friends who have a dog or cat. The difference between airlines (even in First Class) and luxury hotels couldn't be more different, when it comes to allergies. All the hotels I work with are keen to know any allergies my clients have, as well as food restrictions and preferences. The best among them keep a record of these in the guest profile, so as to avoid any issues with future stays at that hotel or even at other hotels in that brand. Airlines, on the other hand, where an allergy situation can be so much more serious due to the very confined space, rarely even offer a peanut-free or nut-free meal among their special order meals, and many won't make a general announcement to all passengers asking them to refrain from eating any peanut products they may have brought with them. There was an NYT article today relating how passengers were kicked off an American Airlines flight just for informing the crew of the kids' severe nut allergies, even though they had come prepared with their own food and medicine. American Airlines is facing DoT complaints accusing the airline of discriminating against allergy sufferers, since American Airlines has an explicit policy denying pre-boarding to people with allergies (not allowing them to preboard to wipe down their seating area to get rid of peanut and nut residue) while not singling out any other group. A number of airlines are completely silent on the topic of allergies, but of major carriers that my clients fly, here are the best and worst airlines for peanut and nut allergies. American Airlines is currently worst, and if you have a severe peanut or nut allergy, you may want to avoid flying them. If you have a severe allergy to peanuts or nuts you may request a buffer zone to be set up around your seat to help avoid the risk of exposure. Only the customers seated within the buffer zone will be informed that they must not consume nut or peanut products. They will not be offered any Air Canada snacks containing nuts. To request the buffer zone, you must contact the Air Canada Medical Assistance Desk (1-800-667-4732) at least 48 hours before your flight. Please inform the head inflight crewmember upon boarding of your severe nut allergy. Upon request, a crew member will create a buffer zone one row in front and one row behind the allergic person. Crew will ask customers seated in the buffer zone to refrain from consuming any nut containing products they have brought onboard and will not serve any nut containing products to these rows. On a recent JetBlue Mint flight, my clients, one of whom has a nut allergy, was helpfully given the ingredients list of all the dishes served in JetBlue Mint by the flight crew, who was also happy to leave off an allergy-containing garnish. Swiss requests all passengers NOT to bring peanuts on board with them. When boarding, you must inform the Cabin Crew of your severe peanut or tree nut allergy. If you request it, Cabin Crew will make an announcement so that other passengers are aware of your allergy. Cabin Crew ill suspend the serving of loose nut snacks in your cabin of travel. Nut-free special meal is available that does not contain peanuts and tree nuts (including almonds, Brazil nuts, cashew nuts, hazelnuts, pistachios, walnuts, pecans, macadamias and their derivatives). You must request a nut-free meal at least 48 hours before departure. Singapore Airlines does not serve peanuts as snacks to Economy Class passengers (as of April 2018) BUT meals with peanuts and/or other nuts ARE served in other classes of service. For example, Singapore Airlines' Book the Cook Meal Pre-Order selections out of Singapore include Chicken and Lamb Satay, which contains a spicy peanut sauce. Singapore Airlines cannot provide a nut-free cabin or guarantee an allergy-free environment on board as other passengers may be served meals containing nuts and may bring their own snacks containing nuts on board. Qatar Airways does not have a special meal that is peanut-free or nut-free, but in the U.S., you can write to specialservices@us.qatarairways.com to request a peanut-free and/or nut-free meal for your flight, as long as it's at least 48 hours before your flight. Note that Qatar Airways also requires a Waiver of Liability for allergies and Medical Information Form for severe allergies to be filed at least 48 hours prior to the flight. Update: As of 12/12/18, passengers with nut allergies may pre-board to wipe down seat area. This change has changed AA's place in the rankings. Cathay Pacific does NOT provide peanut-free or tree nut-free special meals, and cannot guarantee cross-contamination of peanuts and/or tree nuts with in-flight catering. Allergic passengers should bring their own meals that do not require chilling or pre-heating. Cathay Pacific cannot prevent passengers from bringing their own peanut / tree nut products on board, and cannot insist they do not open or eat them. Cathay Pacific cannot make general announcements requesting other passengers refrain from consuming peanuts or tree nuts. Passengers with documented peanut and/or tree nut allergies can, subject to operational limitation, request priority boarding and bring their own cleaning wipes to wipe down their seating area. Passengers with severe nut allergies should bring their own food. Cabin crew will be happy to warm your meal for you. Emirates cannot guarantee peanut-free meals and does not provide nut-free meals–you should bring your own meal on board if you have a peanut allergy. If you have a severe peanut or nut allergy, what has been your experience with airlines being helpful (or not helpful) with your allergy? 13 Comments on "Best and Worst Airlines for Peanut and Nut Allergies"
Thank you for the suggestions and information. So sorry that you struggle with animal allergens. I wish they would make flying more allergen friendly. It’s literally not going to kill anyone if they don’t have nuts on their flight, but it could kill me. I wish airlines would understand that. It would be good to get an update as some of these airlines may have experienced near fatality recently from anaphylaxis and may have changed their mind about the risk of peanuts and treenuts in fights . I was looking in particular for Singapore airline for which there was news in the last year or 2 that they no longer will serve nuts after a boy had anaphylaxis in one of their flights. Thank you for this article. We just returned from the US on Qantas. My daughter has a peanut allergy so the crew refused to give her anything to eat apart from apples! When we flew with Qantas a couple of years ago they were really helpful, however their response now is that ‘she’s better off not eating”! While you’ll know best which foods you can eat given your allergies, keep in mind that Air New Zealand isn’t able to refrigerate or heat anything you bring, so it should be shelf stable or if it’s more perishable, something you’ll be eating early on in your flight. Another thing to consider is ordering a fruit platter as a special meal to supplement the other food you bring, assuming you’re not allergic to any fruits. You can log into “Manage my booking” to select a fruit platter as a special meal. My son has a tree nut allergy but it is only if he eats tree nuts. While we are comfortable with most snacks, and can look at a label, we are traveling internationally for the first time soon and cannot determine if the meals have tree nuts or not. We are on Delta. While they have indicated he has an allergy (and we need to let flight attendant know), is there any way to know if a meal is tree nut free or do we just need to get him a separate dinner? Any advice appreciated.